Asheville, NC is a quirky place, to say the least. There is a saying here: “If you’re too weird for Asheville, you’re too weird.” But its home for me and I love it here. The unique blend of artists, musicians, writers, spiritual seekers, and fringe people of all sorts nestled within the Blue Ridge Mountains makes this the ideal place for me to live. For the holidays, I was given a gift certificate to Malaprop’s, a local independent bookstore that I love to support. 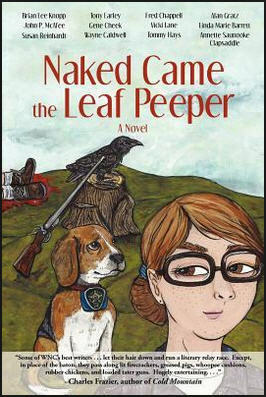 I knew before going there that I wanted to get a copy of Naked Came the Leaf Peeper. I had seen it on display for a while and it has been on my wish list. It is a collaborative work featuring twelve local Asheville writers each contributing a chapter. The book is a riot! I burst out laughing multiple times as I was reading. Some of the scenes are so over-the-top that, even if you are unfamiliar with Asheville, you will still find them hysterical. For example, there is a scene where a vehicle gets stopped for reckless driving, and it is discovered that the woman driver is naked and shaving herself as her ex-husband tries to steer. And the craziest thing is, if you live in Asheville, it doesn’t seem that far-fetched. So at this point, you may be wondering what it’s like in Asheville. Here is a quote that will give you an idea. J.D worked his way downtown, pausing at a light straight across from the Asheville Civic Center so a man and his llama could cross the street in front of him. A man and his llama? J.D. turned off his auto-pilot and really looked around for the first time. There were llamas everywhere. Coming and going from the convention center, walking up and down the sidewalk, sitting on benches and parked cars. In the little park at the end of Broadway, hippies and llamas danced in a drum circle. There was even a llama standing with a tip bag tied around its neck while its owner played a guitar outside Malaprop’s Bookstore. So while this is a little bit exaggerated for humor’s sake, it’s not far from the truth. You’ll see all kinds of people with animals downtown, and there are always street musicians and people dancing around in drum circles. True story—I used to own an ice cream shop here in Asheville. One day a person came in with a goat on a leash and asked if it was OK to bring his goat in. I told him no, that the goat would have to wait outside. He seemed hurt. I couldn’t help wondering about relationship between him and his goat. I had some neighbors once who told me that their friends would not come into Asheville because there were too many “wiggins.” It took me a few minutes to realize that he meant wiccans. Yeah, there is definitely a strong earth-based religious community here and the book includes a nod to them with a pretty accurate depiction of a pagan gathering in downtown. The drummers began to beat their drums slowly, their rhythm increasing as Rowena’s voice grew louder, directing listeners to connect with the Divine within and to the spirits of the land, water, and sky. She called out to the spirits dwelling inside the rock and soil that formed the mountains visible in every direction; she called out to the spirits living in the rivers and springs that nourished the soil, the plants and the animals that drank from them; she called out to the spirits dwelling among the flowers and trees that also nurtured life and brought beauty and comfort. Holding a crystal wand in her hand, Rowena traced a spiraling pattern from above her head to the ground at her feet. She spoke to the dead, honoring those who had come before, and invited them to the circle, too. She undid the boundaries between the living and the dead, the animate and the inanimate, the earth and the cosmos. All were welcome at the gathering. I don’t want to give away too much, but I’ll say that the rest of the book is filled with witty satire, parody, social commentary, literary allusions, and such. While the story is fictional, the depictions of Asheville and the surrounding counties are pretty accurate. I can also say that many of the characters in the book remind me of people I’ve met here over the years, from the conservative to the quirky to the just plain weird. Forget the Keep Asheville Weird bumper stickers. Asheville was weird enough as is. I finished reading this book last night. To sum it up, it is nothing short of amazing, one of the most powerful books I have ever read. Not only is it highly informative and inspirational, it is masterfully written. I strongly recommend this book to anyone interested in religion, spirituality, anthropology, sociology, or with even the slightest interest in human culture. This post covers the second half of the book. I cover the first half in an earlier post. The second half of the book focuses primarily on the voudou rites. It is emphasized that voudou rituals are religious and not magic rituals. The purpose of a religious ritual is very different from that of a magical ritual. One of the rites discussed is that of baptism. I found this fascinating, particularly because all I knew about baptism was Christian-based. In voudou, baptism is the process of making something divine, thereby creating an object that can be used to contact the divine spirits. Voudou rituals are intended to serve the gods, not to attempt to bend the gods to serve the practitioners. For this reason, voudou practitioners are called serviteurs, since they are essentially offering themselves to the gods. The final chapter of the book focuses solely on possession. There is no way that I could do this chapter justice in a blog post. Suffice to say that it is riveting to read. Deren describes in breath-taking detail how it feels to become possessed, the physical and emotional changes that one experiences. It must be read to be appreciated. I will note, though, that she describes the loss of self associated with possession by a loa (divine being) as a feeling of death, since one’s spirit is displaced by the loa. I cannot emphasize enough how powerful this book is. Just looking over my notes as I write this post fills me with awe. Now, as an added bonus and to whet your appetite to purchase and read this book, I am including the film that Deren made documenting her observations. It’s worth taking the 50 minutes to watch. The footage of the rituals, including possessions, is amazing. Enjoy, and thanks for reading. This is a book that has been sitting on my shelf for a while. I picked it up years ago while scouring a used bookstore and had never gotten around to it until now. The book is an anthropological study of the mystical practices of the Azande in Africa and was originally published in 1937. Evans-Pritchard was a Professor of Social Anthropology at Oxford University, so this is not some new age book touting an idealized view of indigenous tribal rituals, but an objective, detailed account of his observations during the time he spent living amongst the Azande. There is a wealth of information in this book and it is written in a style that is accessible and engaging. It is by no means dry academic writing (except for the introduction by Eva Gillies – I would skip over that unless you like that kind of stuff). There were lots of things I could expound upon, but I will limit myself to a few key items. One thing I found fascinating is the observation that the Azande used drumming and dancing to evoke the “manifestation of esoteric powers” (p. 88). This is something that seems to be consistent with most indigenous groups. I think it also explains the current interest in drum circles. Where I live, there is a weekly drum circle in the center of town and it draws many people who participate, either as drummers or as dancers. Regarding the use of oracles, Evans-Pritchard writes: “Azande observe the action of the poison oracle as we observe it, but their observations are always subordinated to their beliefs and are incorporated into their beliefs and made to explain them and justify them” (p. 150). This is true of every culture. Each individual’s belief system determines how that person perceives events. Consider how the beliefs of a theoretical physicist and those of a religious fundamentalist would cause each person to view the same occurrence in a different manner. 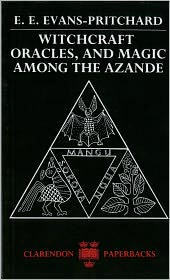 Finally, regarding magic, the Azande believe that the main purpose of magic “is to combat other mystical powers rather than to produce changes favourable to man in the objective world” (p. 199). This is the opposite of what practitioners of magic in the west believe. According to Aleister Crowley, the purpose of magic is to manifest occurrences in accordance with one’s will. This book is probably not for everyone. 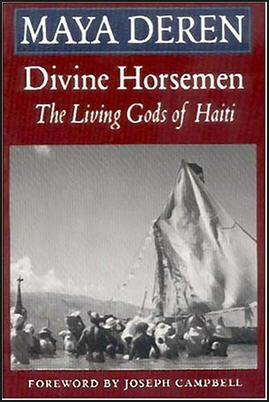 I personally enjoyed it, but that is because I have an interest in mysticism and anthropology. If either of those topics interest you, then you will likely enjoy this book.